This one might more appropriately be filed under "Unexpected comic strips," as it's a bit of a strange one. While nothing that David Lynch does is necessarily expected, a newspaper comic strip is not the first thing one would imagine a surrealist film and television director might do. Even then, if one tried to imagine of what kind of comic strip said surrealist film and television director might create, I don't think it's likely anything like The Angriest Dog in the World would come to mind. David Lynch is best known for his movies such as "Eraserhead," "The Elephant Man," "Dune," "Blue Velvet," "Mulholland Drive," and others, as well as his television series "Twin Peaks." Before venturing into film, he originally wanted to be a painter. As such, his films were supposed to be paintings come to life, if such a thing is possible. To be fair, this one isn't quite as unexpected as the last three, but the newspaper comic strip he created is obscure enough that I thought it was important to cover. 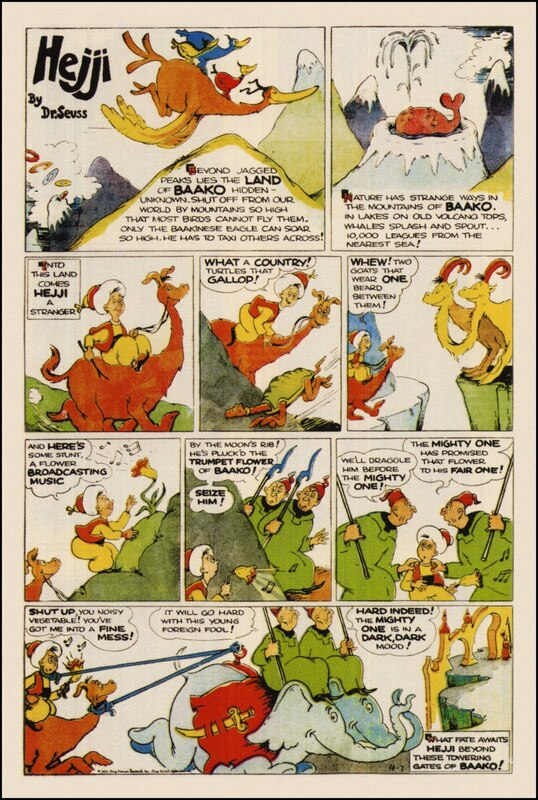 Dr. Seuss is, of course, mainly known for his work in children's literature, but much like Johnny Gruelle he got his start in cartooning and illustration. He began as a magazine cartoonist, and his cartoons first appeared in the Saturday Evening Post and in the humor publication Judge. He also did quite a few advertising illustrations for Standard Oil, NBC, General Electric, and others. His first book, "And To Think That I Saw It On Mulberry Street," was published in 1937. He did quite a lot of political cartooning during World War II, and after the war he would begin his children's book career in earnest. However, in between all of this, for a period of less than a year, he wrote and illustrated a mostly forgotten newspaper comic strip called "Hejji." This one is a bit different from the previous two unexpected creators, because whereas those two were already famous for other things before becoming involved in comic strips, Johnny Gruelle became famous for something else after he had already been working in comic strips for quite a while. Gruelle is most famous for creating the children's toys Raggedy Ann and Andy, as well as writing and illustrating storybooks to go along with them. 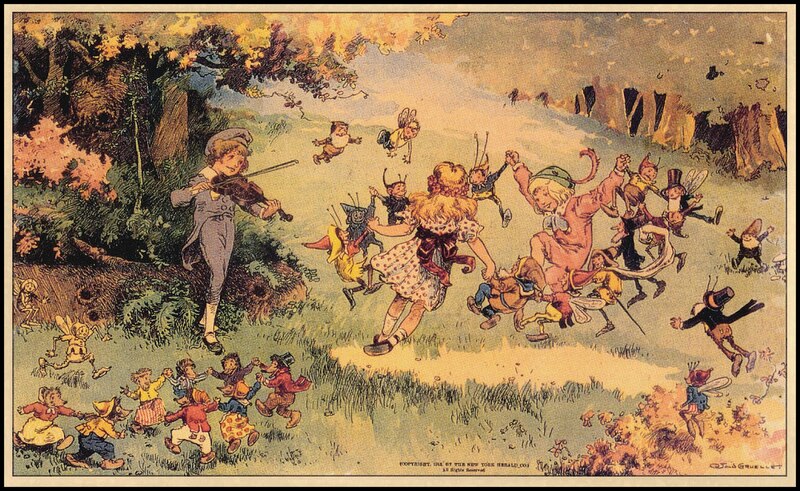 He also wrote and illustrated quite a few other children's books that were not related to Raggedy Ann, including a couple collections of fairy tales. Raggedy Ann was created and patented as a doll in 1915, and she first appeared in Gruelle's books and illustrations in 1918. Andy didn't come along until 1920. Previous to this, however, Gruelle had quite the career as a newspaper cartoonist. The story of our next unexpected comic strip creator will probably sound similar in many ways to the one I wrote about Dashiell Hammett. 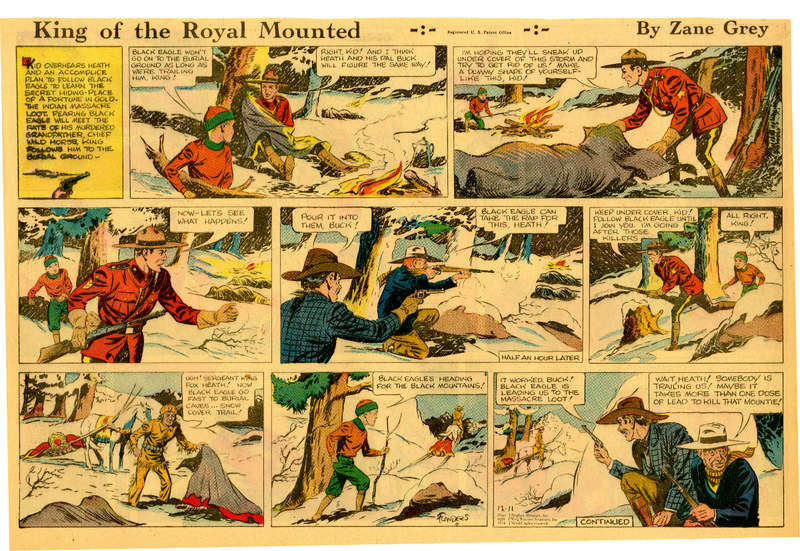 In fact, this post would more appropriately be called "Unexpected Comic Strip Bylines", because although Zane Grey was involved in the production of a comic strip for a short while, his name was used to promote it, as well as other products, for quite a long time after he left. For the most part, comic strips are created by people who are mainly known for creating comic strips. The lay person who is not well-versed in comic strip history may not even know the names of the creators of most of the comic strips they read, and if they do know them they don't know them for anything else. There are, however, some comic strips that were created by people who were famous for other, entirely unrelated things. Sometimes this is because they had a personal interest in creating a comic strip and in doing something different from what they had been doing. Other times it's because a newspaper syndicate wanted a big name in order to promote their new feature. Such is the case with Dashiell Hammett.